The unloading of the nitroglycerin carried from Shelby, Montana, to Calgary, Alberta, aboard the (purple?) Stinson SB-1 Detroiter operated by Great Western Airways Limited, February 1929. Anon., “–.” Canadian Aviation, April 1929, 17. Is that an expression of shock or disbelief I see on your face, my reading friend? Shock would be an appropriate reaction. Disbelief, not so much. What follows is no joke, my reading friend, but I beseech you not to try this at home. This week’s story comes to you courtesy of the most successful aviation magazine in Canadian history, personal opinion, the monthly Canadian Aviation, more specifically its April 1929 issue. Once upon a time, early in 1929 to be exact, Calmont Oils Limited, a British financed Canadian oil company, found itself in dire need of nitroglycerin. Faced with a well near Turner Valley, near Calgary, Alberta, that was not producing much oil, it decided to shoot it, and… No, no, the company’s management did not pick rifles to fire at the well. That would have been silly. Shooting an oil well involved / involves the use of an oil well shooter / torpedo shooter / torpedoman, and… I know this is rather cryptic but just give me a blessed second before hitting the roof. You do not know what a torpedoman was / is? Neither did I, so don’t torture yourself. That’s my job. A torpedoman, say I, was / is a man, and they were all men, women had / have far too much common sense, who lowered one or more canisters of nitroglycerin, known as torpedoes, down an oil well whose production was decreasing or nonexistent in order to fracture the rock and allow the oil to flow more freely. I kid you not. A good torpedoman knew how much nitroglycerin was needed in each case. Using too little would not produce any increase in oil production. Using too much could collapse the oil well or damage the rig equipment. As you may well imagine, oil well shooting was a dangerous occupation, but back to our story and Calmont Oils’ problem. The closest source of nitroglycerin, a highly effective but very dangerous explosive, was Independent Eastern Torpedo Company in Shelby, Montana, a town located at the heart of a large oil field, 400 or so kilometres (250 or so miles) south of Calgary. As luck would have it, the specially-designed and carefully-driven trucks commonly used to carry nitroglycerin over the rough roads could not get through because there was too much snow on the ground. And no, trains were not allowed to carry nitroglycerin. Running out of options, Calmont Oils contacted Great Western Airways Limited of Calgary, which agreed to help. The pilot chosen for the job, company cofounder Frederick Robert Gordon “Freddie / Fred” McCall, was a well known figure in the region. An outstanding fighter pilot during the First World War (35 confirmed aerial victories achieved between January and August 1918), he added to his fame with an incident that took place in early July 1919. As McCall was flying over the site of the Calgary Exhibition, today’s Calgary Exhibition and Stampede, with the 2 sons of its manager, Ernest L. Richardson, disaster struck. The engine of the Curtiss JN-4 Canuck biplane failed. Faced with the choice of making an emergency landing in the infield, where many people were performing various activities, or a controlled crash on top of a (rotating?) merry-go-round, McCall chose the latter. He and the boys walked away without a scratch. The airplane was not so lucky. By the way, McCall claimed almost all of his aerial victories while flying Royal Aircraft Factory S.E.5 fighter planes, a type represented in the incredibly amazing collection of the Canada Aviation and Space Museum, in Ottawa, Ontario, as is the aforementioned Canuck. And no, yours truly does not get a little financial something every time I mention the name of the institution I work for. Do you think I should? 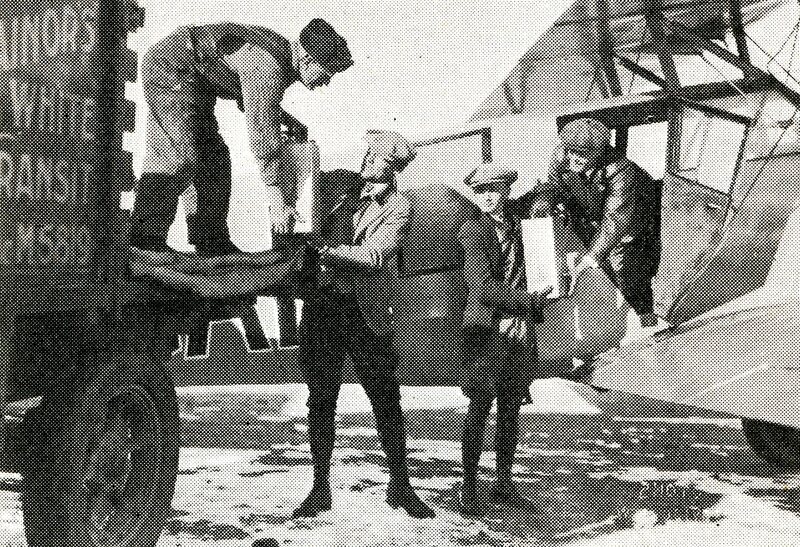 Given that laws in both Canada and the United States prohibited the transport of weapons, explosives and ammunition on civilian aircraft, Great Western Airways contacted the Civil Aviation Branch of the Department of National Defence, at the time the one organisation with powers to regulate all aspects of civilian aviation in Canada, to obtain its permission to deliver the nitroglycerin. Said permission soon arrived, relatively speaking. McCall made 2 trips to Shelby in February 1929 to pick up and deliver the nitroglycerin, as well as a box of dynamite, ordered by Calmont Oils. An oil well shooter by the name of Charles “Charlie / Nitro Charlie” Stalnaker accompanied him on both occasions, aboard Great Western Airways’ sole Stinson SB-1 Detroiter. Interestingly enough, this single engine cabin biplane may, I repeat may, have been painted bright purple, and here lies a tale. Sorry. In 1901, a German immigrant named Fritz Sick founded a brewery in Lethbridge, Alberta, his second such venture in Canada. Started as a one man operation, Lethbridge Brewing and Malting Company had enough employees by 1906 to justify the founding of a union. I like unions, but I digress. Sorry. Ten years later, prohibition became the law of the land in Alberta. Sick survived by making so called prohibition beer with 2% alcohol, in other words a beer comparable to a typical 2019 American light lager (Sorry, sorry, that was needlessly mean.) for the provincial market, and standard beer for markets where prohibition was not in force. Would you believe that he also made some money by keeping fur coats in his cold storage during summer months? Prohibition ended in Alberta in 1924. Sick used this opportunity to acquire existing breweries and set up new ones, in Alberta and Saskatchewan. In 1926, he introduced his most famous beer, Lethbridge Old Style Pilsner. The label, designed by a daughter of his, Louise Sick, included a few means of transport, including a biplane that looked / looks suspiciously like a Canuck. The Saskatchewan Champagne, as this beer was often called, was / is still being brewed in 2019 – by Molson Coors Brewing Company. The same label is still on cans of Old Style Pilsner. Yours recently saw such cans in a convenience store in Montréal, Québec. In 1928, Sick’s brewing empire became Associated Breweries of Canada Limited, the largest firm of its type in Western Canada and the second largest in Canada. He retired around 1930, leaving the company in the hands of a son, Emil Sick. The family sold said company to Canadian brewing giant Molson’s Brewery Limited in 1958, but back to our digression. Sick, Fritz Sick actually, became interested in aviation in 1920, when he became a shareholder of Lethbridge Aircraft Company, more or less a barnstorming company. Indeed, some of his beer ads featured one or more airplanes. Sick, Emil Sick this time around, gotcha!, acquired the aforementioned Detroiter, fresh off the factory, as a company airplane. He then set up Purple Label Airline Limited, which was named after a beer brewed in the company’s Edmonton, Alberta, facility. Private groups soon began to knock on the door of the one airplane operator. In fact, there were so many knocks on said door that Sick set up, you guessed it, Great Western Airways, with the help of the aforementioned McCall, who happened to be a Purple Label Airline pilot, but back to our story. Actually, let us stray from the path for a few moments more. The aforementioned Stalnaker was an American First World War veteran. He became an oil well shooter after the conflict. In 1922, Stalnaker joined the staff of Independent Torpedo Company, as the company was called at the time. He was the one who established the company’s operations in Shelby. On numerous occasions, Stalnaker drove a company truck from Shelby to Turner Valley in order to shoot one or more oil wells. Did you know that he improved the effectiveness of the explosions by packing the well with small rocks after placing the nitroglycerin? Amazingly, Stalnaker continued in this line of work, mainly in the United States, almost until the mid 1960s, when he was well past 70. The amazing career of this legendary figure took him to places as far apart as Wyoming, Texas and Montana, not to mention Alberta, the Northwest Territories and Saskatchewan. He attributed his uncanny longevity to a couple of factors: a great respect for the power of nitroglycerin and a strict non drinking policy whenever he was handling this deadly substance. Stalnaker also insisted on working alone. When he died in 1979, at age 88, Stalnaker may well have been the oldest oil well shooter left alive. And now back to our story. The arrival at Calgary of the Stinson SB-1 Detroiter operated by Purple Label Airline Limited before this company was absorbed by Great Western Airways Limited, April 1928. CASM, negative number KM-08272. Many Shelby residents witnessed McCall’s first takeoff from a safe distance of about 1.6 kilometres (1 mile). This, after all, was probably the first time nitroglycerin was carried by air in this part of the world. Incidentally, McCall seemingly carried 95 or so litres (21 or so Imperial gallons or 25 American gallons) of the deadly liquid on that first flight, as well as a box containing 12 sticks of dynamite. To make things even more fun, he had to fight a powerful headwind for most of the way to Calgary. The landing at the end of the first trip was uneventful, despite somewhat of a bounce on touchdown. The small crowd of well wishers may have gasped a little. Once the explosives the airplane was carrying were unloaded, a mechanic attempted to taxi the Detroiter into a hangar. The engine soon stopped. A quick look showed that the airplane was out of gas. Another version of the story suggests that said engine stopped seconds after the Detroiter touched down. The caption of the photo at the start of this article might be useful at this point, so there it is. When Capt. F. McCall, of the Great Western Airways, and Charlie Stalnaker, of the Eastern Torpedo Co., glided to earth with a cargo of [95 or so litres] 100 qts. of nitro glycerine which they had brought from Shelby, Montana, to Calgary, they solved a transportation problem which may be of great importance to the development of Alberta’s oil fields. Above Mr. Stalnaker is shown handing a [9.5 or so litre] 10-qt. container to the drayman. Capt. McCall is on his right receiving a container from Eddie Stinson, who is in the cabin of the Stinson Detroiter used on the trip. Roads that were impassable for trucks on account of drifted snow caused the Calmont Oil Co. to charter the plane. The “soup” was used to dislodge an obstruction in their well at the [1 525 metre] 5,000-ft. level. The second flight from Shelby to Calgary was uneventful. The take off was a bit hairy, however. McCall had to run the Detroiter 1 200 or so metres (almost 4 000 feet) through about 45 centimetres (18 inches) of snow before it could take off. He barely cleared a huge snowdrift. Did I mention that the Detroiter was not fitted with skis? And now for something completely different. Did you know that the SB-1 Detroiter inspired, to some extent, a now forgotten Canadian airplane? No? Oh joy. Can we talk? Actually, can I talk (type?)? The fall of 1927 was not an easy time for Canadian Vickers Limited of Montréal, a shipyard that manufactured and designed aircraft mentioned in a few issues of our blog / bulletin / thingee since May 2018. A project started in 1926 was going through hard times. Wishing to gain a foothold in the Canadian market for small commercial aircraft, then dominated by American companies, this aircraft manufacturer designed a cabin biplane, a Canadian first, and this from its own resources. A senior officer of the Royal Canadian Air Force (RCAF) saw the Vanessa prototype under construction and asked Canadian Vickers to deliver it to this service for use as a light transport aircraft. The management agreed, much to the chagrin of the chief aeronautical engineer, Wilfrid Thomas Reid. Tested in April 1927, the Vanessa had to be modified to improve its performance. And yes, my reading friend, Reid was the founder of Reid Aircraft Company Limited, a firm mentioned in a March 2019 issue of our blog / bulletin / thingee, but back to our story. The RCAF was sufficiently impressed by the Vanessa’s potential to have it fly from Ottawa to Rimouski, a city located in the Bas Saint-Laurent region of Québec. Once there, it would wait for a Canadian Pacific Steamship Limited vessel arriving from Europe. Once loaded with mail bags, the Vanessa would fly back to Montréal. The floatplane left Ottawa in early September 1927, as planned. The mail was put aboard 4 days later, in the morning. As the Vanessa began to rise off the water, a float fitting failed. The aircraft leaned to the right so quickly that the propeller cut off the front of the float. The Vanessa sank within minutes. While the pilot and mail were saved by the fast acting crew of a pilot boat, the aircraft itself was too seriously damaged to be worth repairing. Canadian Vickers abandoned fairly quickly the idea of manufacturing 2 Vanessas. The company’s technical staff, which had problems accepting that the company had sold the first one even before its first flight for the sole purpose of making a little money, did not like either that a project with a certain potential was abandoned so quickly. Do you have a question, my reading friend? Don’t be shy? I don’t bite, too often. You wish to know more about the Detroiter? Oh goody. This 4 / 5-seat aircraft was the first design put in production by newly founded Stinson Aircraft Corporation, a firm whose name was mentioned in a March 2019 issue of our blog / bulletin / thingee. It was derived from a prototype designed and test flown, in January 1926, by a well-known American, Edward Anderson “Eddie” Stinson. Four of the 25 or more Detroiters made in 1926-27, in a suburb of Detroit, Michigan, of course, were flown in Canada, all of them, at one time or another, by Ontario-based Patricia Airways and Exploration Limited, but back to our story. Again. Sorry. And yes, my reading friend, Stinson was apparently in Calgary to welcome McCall and Stalnaker. A carefree Oklahoman by the name of Vernon N. “Crazy” Johns may have been the first person to deliver nitroglycerin by air. He seemingly did so using a First World War vintage Standard J-1 2-seat biplane. The nitroglycerin was delivered to individuals who used it to take care of one or more oil wells. And yes, my reading friend, a J-1 was mentioned in a December 2017 issue of our blog / bulletin / thingee. Good for you. I had forgotten all about that, but you are the one who’s digressing this time around. Johns was a motorcycle police officer in Tulsa, Oklahoma, around 1915. He went to France with the United States Army in 1917. Johns learned how to fly after returning to Tulsa, presumably after the First World War, and became a barnstorming pilot. He got his nickname for his apparent lack of fear. There was nothing the Johns would not try. Many thought that this charming lady killer was called “Crazy” because he loved to tell crazy stories. Some said he got his moniker because of the funny letters he had sent to his parents during his stay in France. A few believed that his alleged daftness followed an accident suffered one summer evening. While driving his motorcycle, Johns saw 2 headlights well ahead. Believing that 2 motorcyclists were coming his way, he decided to give them a scare by driving between them. Having shut down his own headlight, he roared ahead only to discover that the headlights were attached to an automobile. Yours truly wonders if the nitroglycerin flight involving Johns took place in March 1921. Toward the end of the month, a pilot hired by an Oklahoma torpedo company delivered a consignment of nitroglycerin to an oil field also located in Oklahoma. The explosives were delivered by air because the roads were all but impassable. You may be intrigued to hear that, in the late 1920s and / or early 1930s, a well known American wholesale grocer, Reid, Murdoch & Company, sent its Ford 4-AT Tri-Motor business airplane, piloted by Johns at least part of the time, on a tour across much of the country. Fitted as a flying supermarket / grocery ship, Independence, as it was called, was used to promote the company’s Monarch canned and bottled products. When Reid, Murdoch & Company moved to other forms of advertising, in 1931, it sold the Tri-Motor to Johns for a dollar. The latter seemingly operated the aircraft until 1935, when it was all but destroyed. Johns’ copilot, by the way, may well have been named Cocoa. The main distinguishing feature of this patient and friendly dog was a gleaming gold tooth, fashioned by his master. Johns gradually abandoned aviation and found other forms of employment. He left this world in October 1962, at age 70. McCall, on the other hand, kept on flying until the start of the Second World War, in September 1939. He joined the RCAF and served in various locations in western Canada. McCall died in January 1949. He was only 52 years old. Would you like to go through yet another pontification by yours truly, on the Tri-Motor, one of the classic airliners of the 1920s and 1930s? I can’t believe my ears / eyes. How could you turn down such an offer? Very well, let us proceed to the nearest exit. And yes, I’ll be back, with pontification galore. Bwa ha ha ha ha. Sorry.